Baldwin Hardware has a rich heritage of delivering modern luxury to discriminating homeowners. Baldwin Prestige Series offers effortless, accessible style and luxury. With the Baldwin Prestige Series, any homeowner can instantly create an atmosphere of confidence from the moment someone knocks on the door. Baldwin Prestige Series is affordable luxury. The Baldwin Prestige Tobin Lever features a traditional inspired design which is offered in keyed-entry, passage, privacy, and half dummy functions. Affordably outfit interior doors with this lockable lever set from Defiant. The Kensington privacy lever easily mounts to doors 1 3/8-inch to 1 3/4-inch thick with the included hardware. Perfect for all bedroom and bathroom doors where privacy is desired. Provided with this set is an adjustable backset and interchangeable faceplates for drive-in and traditional installations. This sturdy lever nicely coordinates with other fixtures in your home for a cohesive look. A lifetime warranty ensures that this device will withstand frequent use. Prestige Tobin Satin Nickel Universal Bed/Bath Door Lever Baldwin Hardware has a rich heritage of delivering modern luxury to discriminating homeowners. Baldwin Prestige Series offers effortless, accessible style and luxury. With the Baldwin Prestige Series, any homeowner can instantly create an atmosphere of confidence from the moment someone knocks on the door. Baldwin Prestige Series is affordable luxury. The Baldwin Prestige Tobin Lever features a traditional inspired design which is offered in keyed-entry, passage, privacy, and half dummy functions. 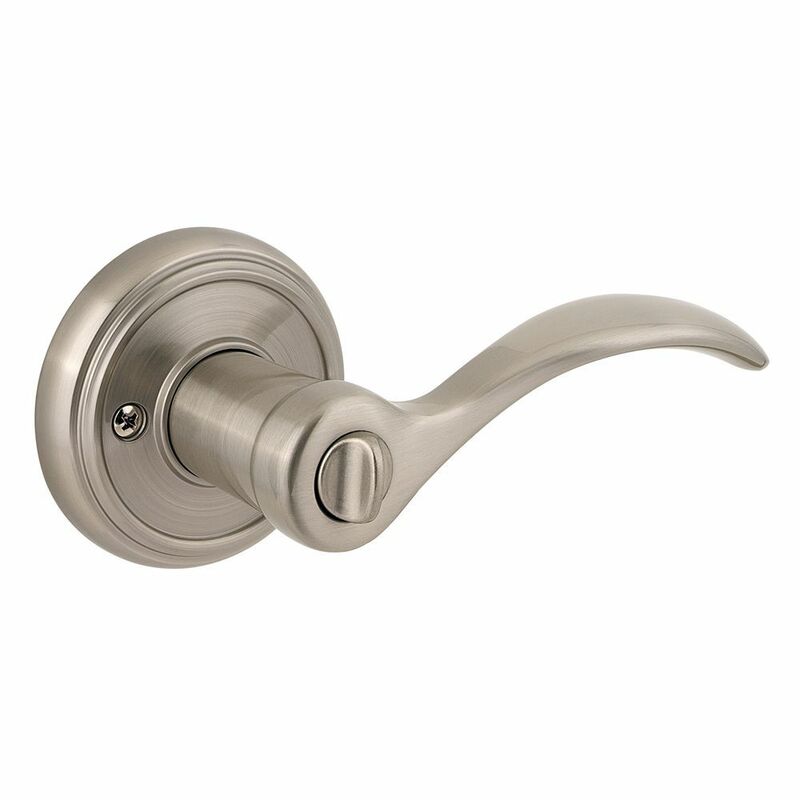 Prestige Tobin Satin Nickel Universal Bed/Bath Door Lever is rated 4.0 out of 5 by 8. Rated 5 out of 5 by Froggy from The Lock Set is finished well, looks good and is working perfectly. Very good product. The Lock Set is finished well, looks good and is working perfectly. Very good product. Rated 2 out of 5 by Dave from Baldwin really cheapened their product to sell it in Home... Baldwin really cheapened their product to sell it in Home Depot. No finished (typical)strike plates with deadbolts. Finished on some parts, ie backsets, that don’t match brushed nickel finish. Very disappointing. Rated 5 out of 5 by Patrick from Replaced all of the interior door hardware in our house.... Replaced all of the interior door hardware in our house. The Baldwin product assembled well and looks great. Rated 5 out of 5 by JertheBear29 from Baldwin Door Hardware Product is excellent as always. Have used it on our last 3 homes. Very satisfied. Rated 4 out of 5 by TeamCowart from Like the look of these locks for all our doors in the house These were easy to install and I really like the look of the door handles.